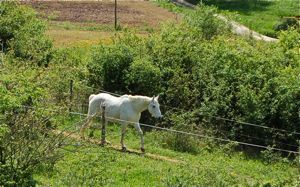 A stiff horse is not an unusual phenomenon, in fact many horse owners are unaware of the extent of the lack of suppleness their horses live with every day, but where does stiffness actually come from? This is the story of a horse who's stiffness was a symptom of much deeper problems. Tali certainly wasn't born a stiff horse. He is a pink papered Hanoverian about 16 hands high, probably one of the best bred horse we have taken on (not that our horses are all advertisements for good breeding!). He had what is unfortunately a fairly typical horse's life in the nine years before we knew him. By this time he was, physically, a classically 'stiff horse' with rigid sides, back and neck. He had a wooden mouth and was suffering from post traumatic stress in many aspects of his life, if not all. He has always had a 'gentlemanly' disposition however, so the extent of his traumatization was not obvious to us at first. He was branded at only a few days old in Germany, which probably didn't give him the best associations with people from the outset. We know from his papers that he was exported as a five year old to Scotland, where he was kept at livery yard, doing dressage, until his owner swopped him for a jumping horse, and he ended-up at a dealers yard. There he was found by a client of ours, and when he proved too much for her, we took him on. A big part of the rehabilitation process we go through with a horse is 'working back through the layers' of whatever life experiences have left their mark. We believe in the accuracy of what comes up through the various different therapies we use, because we have had so many affirming experiences. Whether these are finding out from people who have known a horse before, comparisons with very similar cases, or the manner with which such damage in a horse heals itself, in general the truth is there if you know how to listen for it. In fact, it doesn't really matter at the end of the day what actually happened in each horse's life, only that something did happen, and that the consequences are recognized. Recognition of each different layer is the key to healing. It is in fact these memorized layers of physical and emotional 'damage' which result in what we call a 'stiff horse', and Tali certainly had his share. When Tali arrived it was not immediately obvious that he was a stiff horse, but we did notice that his back was an unusual shape. Partly because of the build-up of strangely placed muscle over his croup and partly because the pelvis itself was sitting at an angle in relation to the spine which made him look very bunched up - as if he was raising his back up all the time. His back feet were a strange shape as well. We understand much more these days about the plasticity of horses hooves, and how they will take up the shape over time of the pressure they sustain. For example a horse with different shaped feet is most likely putting weight differently into each foot for some reason, and the size and shape of the feet reflect that. Personality-wise, Tali was quite a bland horse really. He didn't seem to have much character and he didn't really relate to people. He was polite in the sense that he didn't push into your space and he did whatever he was asked. He was distant though, and we understand now that this lack of personality on his part was a sign that he was actually quite a seriously traumatized horse. A physically stiff horse is maybe easier to recognize that an emotionally stiff one because most of us spend more time studying the physical nature of our horses. Tali's stiffness was infused through his whole being, and most of the time his behavior reflected that i.e he did everything in a dull but effective kind of way. Ultimately we would realize that what we called 'stiffness' was in fact 'protection'. Horses have a survival instinct which is second to none. They are well aware that success in the world, on a certain level, is judged by performance, and they know that the bottom line is that their survival is subject to their performance. Tali was protecting himself, but it would be several years before we would find out why. If he got tired out on a hack (in fact it requires a vast amount of energy to maintain a compensation the way he was doing) he would become more and more anxious, pulling and jogging and if he wasn't restrained he would have ended up out of control. He was a stiff horse for many reasons we were yet to discover, but we could feel at the time that he had been trained by force. This is easy enough to recognize because such horses then have to be ridden forcefully or they will be either unresponsive to sensitive riding, or become uncontrollable. When Tali was not ridden 'effectively' (forcefully) he would gradually become faster and end up running away with people. This return to the flight response can be therapeutic for such horses if it can be supported in the right way. At this point it wasn't therapeutic for Tali, because when it happened both he and his rider were frightened and he was further traumatized. When he was challenged by a new situation or circumstance his true lack of confidence would become apparent. One day a white plastic bag got stuck in a very tall tree on the route we took to the field. There was no alternative way, and it was very windy, so the bag was a real horror for the horses the first day. As the others got used to it, Tali got worse. He didn't seem to be able to process his terror and accept that he was not in any actual danger. We understand this now as a symptom of post traumatic stress. Other trigger situations that made him panic were being separated from other horses, and any aggressive treatment from a person handling him - even momentary. In response to these triggers his whole body would become rigid with tension, and he would become extremely bargy and irrational. 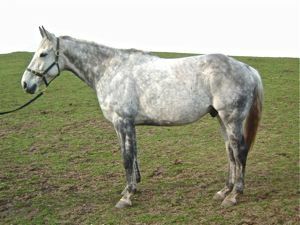 It is possible that with more experience of working with horses like him, and being able to recognize that his 'stiff horse' label was actually the symptom of a major physical compensation, we could have reached the next stage sooner, but things do seem to take the time they are meant to, and it took Tali another two years of schooling and therapy for the real damage in him to reveal itself. What Does The Unwinding Process Involve? Like most people who are willing to learn, over the years we have been evolving our philosophy and methodology radically - letting go of some things and embracing others over a period of 25 years. When Tali's problems were unfolding we were developing our appreciation of the importance of rider biomechanics and alternative therapy, in particular Cranio-Sacral Therapy and herbal nutrition. 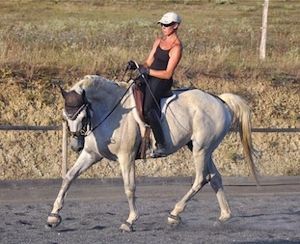 We realized long ago that most horses (and riders) have their fair share of physical and emotional issues, and attempting dressage training without addressing these usually means ending up with a stiff horse and rider. This stiffness comes across in a particular way. Some aspects of the horse's physiology will seem too loose, and some too tight, so the result is a kind of mechanical efficiency which allows such horses to be precise and apparently proficient in the various dressage movements, but unfortunately they just don't look very beautiful. We have found that putting the achievement of suppleness and therefore liberation (physical and mental) above all else i.e above the performance of particular gaits or movements, demands the continual addressing of whichever physical or emotional issues arise as a result of the suppling process itself. Tali was a stiff horse because he was living with many layers of physical and emotional tension which had been 'locked away' in order to allow him to function and meet our needs. The first step in encouraging him to start the unwinding process was to convince him that we would keep him and look after him whatever the result of his opening up was. Security is one of the biggest issues horses have, and they won't tell you their secrets if they aren't sure they will be safe afterwards. The best way to let your horse know this, is for it to be true! Like children, horses are very sensitive to the integrity of the people around them, they aren't easily tricked. All horses are different and the insecurity of some runs very deep, even when the problem seems as banal as a stiff horse. Horses heal when they are ready, and only they will decide when that is. The best we can do is provide the right environment and be patient. Tali was as effective at unwinding physically as he was at protecting himself. When it happened it was sudden and violent. Until then he was chugging along stiffly (a friend of ours who rode him at this time referred to him as 'a riding school horse'), and almost from one day to the next he had fallen apart. He had been doing some fairly demanding bending work in canter, asking him to stay straight and carry his own body, as well as having some Cranio-Sacral treatment focusing on his lumbo-thoracic junction. This is the part of the horse's spine where there is often strain due to the 'fishtailing' effect when a horse is not engaging properly, and their back end moves without correct transmission through the raised spine to the front-end of the horse. Until this point, Tali had never been able to achieve true engagement due to this lack of transmission, but his schooling work and therapy had been bringing him closer and closer to unraveling his problems. There probably wasn't one distinct reason for his letting go, but with hind-sight we realized that for a large part of his life Tali had been holding his pelvis stable by stiffening his spine. This is surprisingly common amongst horses, and there are doubtless many horses out there 'hiding' a damaged pelvis through holding a part of their spine rigid. The holding part is called a 'fulcrum' and the whole dynamic is referred to as a 'compensation'. Horses who are compensating in this way can appear 100% sound and often pass a vetting. When a compensation breaks down, sometimes because of age (the body can only dissimulate so much damage, and at some point the problems will start to surface), or in this case because of a healing process, the visible symptoms are as if the initial injury had only just happened. Tali's whole back end seemed to have fallen away, as his spine loosened. He had been holding himself shorter for all these years, so his body had adjusted itself to this, in particular the tendons and ligaments of his back legs, but even the shape of his feet had adapted. The result of the sudden lengthening of his frame was a kind of collapse in the susepensory ligaments of his hind-legs, and his fetlocks behind were virtually sitting on the ground. As well as this, the musculature he had been building up for so long to support his compensation was now obsolete. There is a balancing out of the work the postural muscles perform, like a rotation system. this is necessary to maintain their health because they are working continuously to support our skeleton. In the case of a stiff horse, this rotation system has been disturbed so that some groups of muscles are permanently in contraction, and some are permanently relaxed. Tali must have been living with a serious imbalance, because when the nervous system re-patterned itself, releasing the compensation, the musculature of his entire top-line seemed to have wasted away. He looked like a horse on its last legs, and most of the people who saw him at that time didn't think he would survive. One acquaintance, who was training in horse massage at the time, told us it would be a miracle if he was ever able to be ridden again. We had a different perspective in fact. Although undoubtedly his physical appearance was pretty grim, we saw other changes which were encouraging. Whereas before he had always had a kind of dirty yellow tinge to his coat, when his compensation lifted he seemed to have a beautiful new whiteness. He also had much more character and despite his poor physical condition he never seemed depressed, or as if he had given up on life. It was more the opposite, that finally he was ready to achieve something. 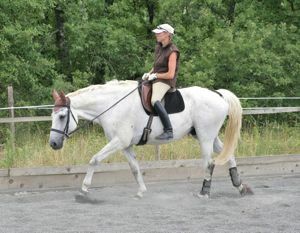 When we began riding him again, his movement was much more supple, even with his lack of muscle and strength. The original injury which had rendered him such a stiff horse, and that he had been compensating for for so many years, turned out to be serious damage in his right hip joint. This explained the way he was always so blocked in the right side of his mouth - because taking weight in that leg to push off and stay carrying and soft through his right side was impossible for him. It explained why he was so crooked and difficult to reach, and also why he became easily stressed when he was asked to straighten his body. 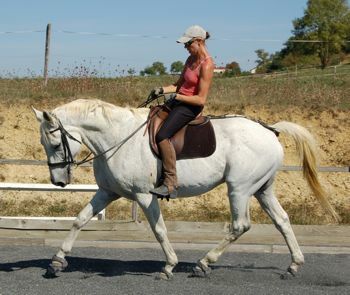 It explained why he would get tired easily out on a hack and want to jog and pull so he could balance on the riders hands instead of taking more weight in his hip. It explained the strange shape of his feet and the build up of muscle on the top of his croup. Tali gradually built his condition back up. He had a lot of Cranio-Sacral therapy on his hip, his back and whole system in general. 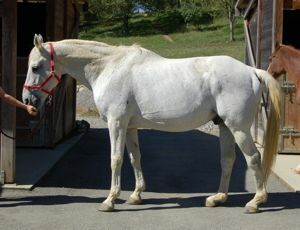 His right hip, which had probably been fractured, was reconstructing itself, and his hocks and fetlocks were badly swollen for a long time because of the damage they had sustained from years of absorbing the shock from his stiff movement and not having the best support from the nerves and blood supply as a result of the damage higher up. He had probably been in some gadgets and severe bits along the way in an attempt to control his pulling, which will have added to the wear and tear. Although he went through many more layers of restrictions in his neck and pelvis and spine, there was a definite progression after the main compensation had been lifted. This is because the horse is positive about the process because his problems are all out on the surface, and he is no longer trying to defend his own system of defense. Once Tali was strong enough to start working, he was lunged very gently and carefully, allowing him to rebuild his body in a straightness that wasn't possible before. His hind leg movement was quite un-level which was new, but he flowed in a way he hadn't been able to before. In his case, because he was already well into his teens at this point, we were running out of time, but when he was ride-able again, he felt soft in his back at last, and was able to soften in his jaw and neck in a way he probably hadn't done for the vast majority of his life. 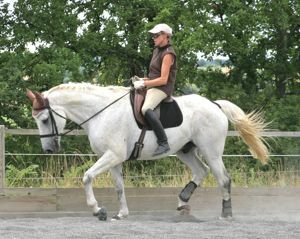 In his subsequent schooling work, he went through a process of releasing his tension and gradually learning to trust his rider. During this time, he had to be ridden with an extremely allowing contact, and whenever he came against the bit it was crucial for the rider to release (or yield) the rein to avoid him starting to panic. 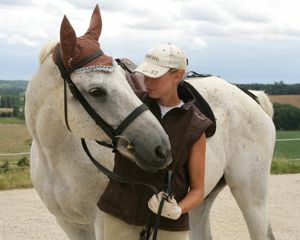 He had to completely re-learn that the rider was not going to force and constrain him, and for a considerable period this required a very delicate balance between helping him posturally to stay in balance and carry himself as he had never been able to before, and avoiding triggering his stress responses by strong aiding, or any form of holding. The trapped tension that had made him into a stiff horse had to be allowed to release, both physically and emotionally. This was as much a mental test for the rider as a physical one, because it was an essential part of the healing process that the rider completely trust him to be able to stay in balance and not run off without being held onto. Only then was he able to give his trust back. It became clear that in the past he had been similarly traumatized to the forceful use of leg and spur, making him hypersensitive to the leg, tensing his sides and running when it was used even gently. We discovered that he was a lot happier to accept the leg calmly when ridden without stirrups, perhaps because the metal of the stirrup touching his sides reminded him of spurs. Gradually he became more and more accepting of the leg, and also learned to listen to the seat's collecting and re-balancing aids instead of stiffening against them as he had done before. As he began to gain strength, the difference in his whole way of going from before his breakdown was dramatic. Once a stiff horse, unable to stretch longitudinally, now he stretched naturally, and his movement had became loose and supple despite the remaining physical damage. The tension that had fixed him into just another stiff horse, was now releasing allowing him not only to enjoy his work, but to actually achieve true engagement for the first time. Working in engagement was to become a vital part of him building up the postural strength necessary to compensate for his damaged suspensory ligaments, as well as building up the strength of his damaged right hip. This became obvious, because every time he was rested off work for any length of time, his back would begin to stiffen up, whereas with work he stayed loose in between times. The suppling effect of engagement is indispensable for the rehabilitation of a stiff horse. Arguably more important than all of this, his personality had started to come out. He had an opinion at last - still in a gentlemanly way of course - he had something to give. 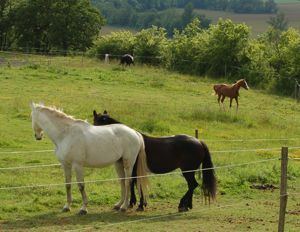 He started to have girlfriends in the herd, in fact he had an extremely close relationship with one mare (left), who sadly left him for another man after a few years! He didn't let it get him down though and today, he has another girlfriend, and on top of that is joint passive leader of his herd. Part of what made Tali a stiff horse was the fact he had been badly traumatized by his experiences (other Horse Stories will go into more detail about the healing process of traumatization). After his 'healing crisis' he was much more open to resolving this, and although it is a slow process, he has reached the point where he is relaxed and reliable in many situations where before he would have panicked and behaved extremely irrationally. Today, at seventeen years of age, he continues with his training, becoming looser and stronger every day. 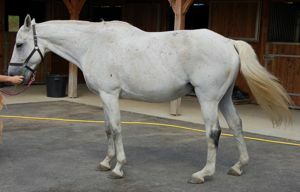 He is still low in his hind fetlocks, but most of the swelling of his hocks, fetlocks and ligaments has disappeared, his feet are a more normal shape at each trim, and his lameness has gone. His haunches and back are now well muscled, and at last he puts weight on his ribs. In fact this year is the best he's ever looked since we have known him. His nickname is the 'miracle man' and he continues to resolve his emotional issues which are, in our experience, both the source of the physical issues we attract in life, and the most difficult thing to come to terms with. When he comes down the lane to get his feed in the morning, he certainly isn't a stiff horse anymore.